How much of what THEY know do WE need to know? 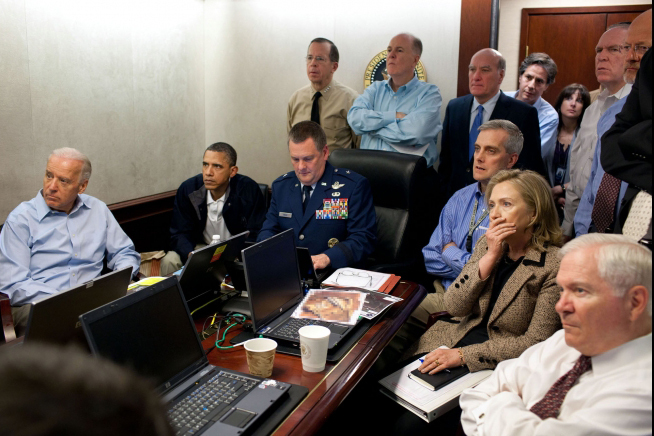 Has the U.S. Said Too Much About the Bin Laden Raid? Military officials fret that constant stream of leaks may hinder future missions, put Navy SEALs at risk. In the nearly two weeks since the U.S. operation that killed Osama Bin Laden, a near-constant stream of detailed information about the raid’s specifics has seeped out from White House officials, lawmakers, and pretty much anyone else with security clearance. The White House announced last week that it was done briefing reporters on the specifics of the mission, but that has done little to stop the ongoing flow of new details from being reported. The latest major leak came Thursday night, when CBS News gave a detailed play-by-play of what the Navy SEAL team’s helmet cameras captured during the raid…. There is the danger that the more we know about details of the raid, the greater potential for threatening our capability to do something like it in the future. For instance, the lede story on The Washington Post‘s front page yesterday told us that a key element in preparing for the raid involved high-altitude drones flying WAY deeper into Pakistan than the Pakistanis suspected we were going. So that we could get higher-resolution photos than you get from satellites. And if you consider how high-resolution satellite photos can be, these images must have been pretty awesome. So… you have a revelation of greater technical capability than the world might have expected, and of a tactical deployment that no one knew about. Of course, it’s a two-edged thing. Let enemies and potential enemies know what you can do, and it could intimidate them into deciding they don’t want the United States as their enemy after all. Or at least, it MIGHT work that way with some — say, your less fanatical foes. But let anyone know what measures you are capable of, and it empowers them to develop countermeasures. That’s a huge theme in military history — measures and countermeasures — and it never ends. We may find all these details fascinating — I know I do. But how much of it do we really need to know? This entry was posted in History, Intelligence, Marketplace of ideas, Military, Strategic, Technology, The Nation, The World, War and Peace on May 19, 2011 by Brad Warthen. No, it’s about psyching the enemy about what you MIGHT do. How much more effective might it have been if the White House had announced that OBL had been dispatched, and no, we’re not gonna tell you how we did it. When it comes down to choosing secrecy over transparency I’ll take transparency 99% of the time. Not sure what good keeping the basics of this raid a secret would do. Let the world know how we did it and let them know we have many other tricks up our sleeve. Given the pathetic nature of Al Queda, as evidenced by Bin Laden’s channel surfing, that would likely deter more bad guys that a million cluster bombs. Its a balancing act. One of the most critical leaks, for me, was the capture of the computers and other materials. The leadership of Al Qaeda now has to consider what MIGHT be now known about them. There are boogey-men everywhere to them now. Any planned attach has to be rethought or dropped. They have to change all of their procedures for coordination and communication. Leaking information about Bin Laden will confirm to them that they have the goods. I’ve read where a book is due out soon explaining the Roswell NM incident as a Soviet endeavor connected to Area 51 or whatever? That’s what the Bin Laden murder should have been…us guessing 64 years from now what really happened. We do not need to know the details. It’s good enough to know the end result only.